I arrived at my destination, Amtrak’s South Station in Boston, right on time. As I approached the doors to exit the station, my eyes suddenly focused on a shocking scene. Not only was there a torrential downpour – that was not a surprise, it had been raining as I departed New Jersey early that morning as well – but added to that downpour were gale force winds. It was like something out of a cheesy Hollywood disaster movie. I saw debris flying by horizontally, people struggling with popped-inside-out umbrellas as they attempted to fight the winds and stinging rain to remain on their feet. “What?,” I said, trying to hear him over the noise of the pounding rain and gusting winds. Then I saw him and headed out to hop into his car. We both took a deep breath…and broke out laughing. What a ridiculous set of circumstances. I was soaked…and so was he. But here we were, on our 90-minute drive to the tiny burgh of Newmarket, New Hampshire – a state so small, many Americans have no idea where it is. The rain never let up that day…it was relentless. But good conversation and my curiosity about this long time leading industry brand quickly brightened my mood, shortening the trip to Newmarket. For better…or for worse…my adventure had begun. First order of business, a full tour of the facility. This tour would end up taking the bulk of the day – both the tour, and my photographing several elements of it. 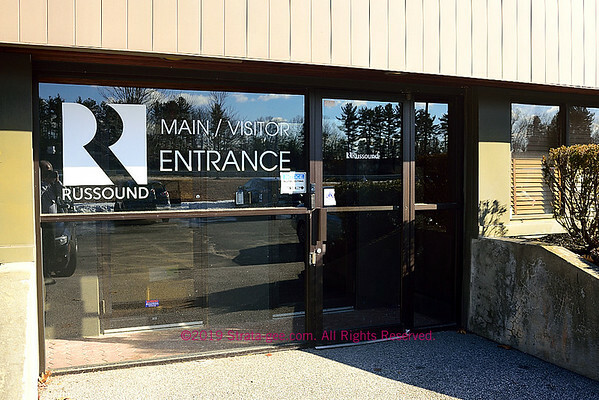 Russound Headquarters in Newmarket, NH. Don’t let that blue sky fool you, it was cold and icy when I took this photo on Day 2 of my visit. It rained all day of Day 1. If you look closely at the shaded side of the building, you’ll see the Russound “R” logo. New Hampshire is known as the Granite State, and Russound has the stone in front of their building to prove it. However, don’t let this photo with its sunny, blue skies fool you, it was raining cats-and-dogs when I arrived and never let up until later in the evening. This photo was taken on the second day, when the rain let up…but the cold didn’t – see that white fluffy stuff on the right? Also, some of that rain – now frozen – made the parking lot a pretty risky place to walking (or driving). It may be hard to see because the low angle of the mid-winter sun is at a pretty severe angle, putting one side of the building into a very dark shadow…but it actually shows the “R” Russound logo and “BLDG_”. Yes, there’s a space after BLDG…it used to say BLDG 2. 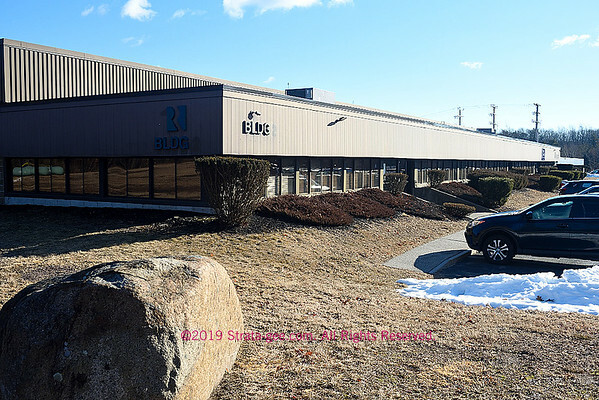 A few years back, the company had actually resided in three different buildings in this industrial park that they owned and operated. However, coming out of the last recession in 2008-2009, the company was forced to rationalize its operations and cut overhead. All three buildings were consolidated down to this one building, which now houses all Russound operations. The entryway into Russound is basic and perfunctory. A video setup with a normally operating “Welcome” video was temporarily inoperable…waiting for a repair part to arrive and fix the set-up. These types of adjacent industry technical failures always strike me as somewhat ironically humorous. 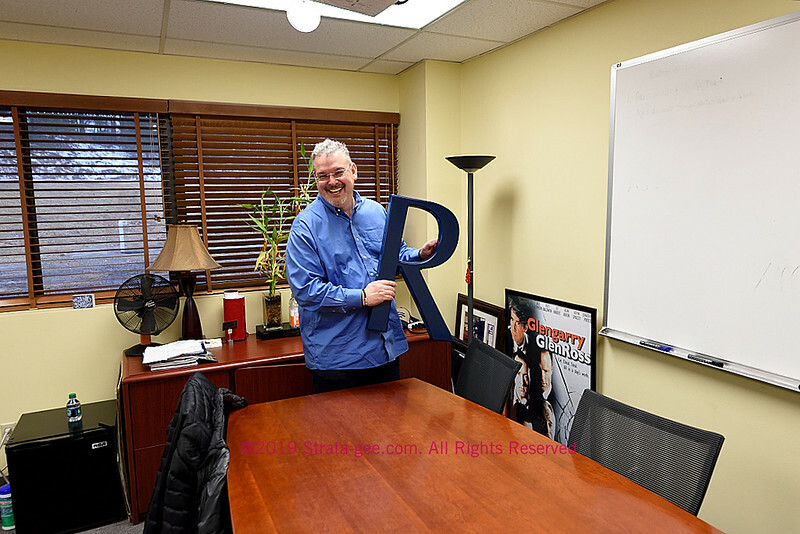 My first stop was the office of Russound COO and VP of Products Colin Clark. I love product guys’ offices – they’re always so messy and stuffed to the gills with all kinds of products, parts, and paraphanalia. Clark didn’t let me down…his office was appropriately disheveled (although cleaner than most). I would have been disappointed to have found it any other way! As I looked around his office, I saw both new and old Russound products, a lot of pieces and parts – crossovers and the such. There were also lots of competitive products, such as Polk, Sonos and others – as any product worth his salt has to know what others are offering as well. Russound CEO Charlie Porritt’s office. I wonder what they wiped off that board before I got there. I can almost read it! Near Clark’s office is both Charlie Porritt’s office, as well as owner and President Maureen Baldwin’s office. Porritt’s office is fairly large, but not ostentatiously so. His space includes a private conference area with a large white board that looked recently wiped…something that this member of the media is used to seeing frequently when visiting executive offices. 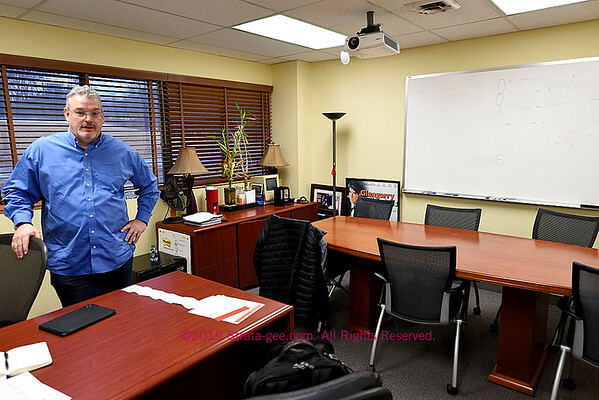 Although Maureen Baldwin was at her Florida home the week I was visiting the Russound HQ in Newmarket, I was allowed to enter her office which is fairly compact and functional. I’m told this fits her personality – as she is said to be a person who likes to immerse herself in her work. I did find a cool collage of various Russound logos. They’ve had a few over the years since their founding in 1967, and this artwork displayed them nicely. Clark was my main tour guide and he walked me around to meet many of the executives and employees busy at work there. 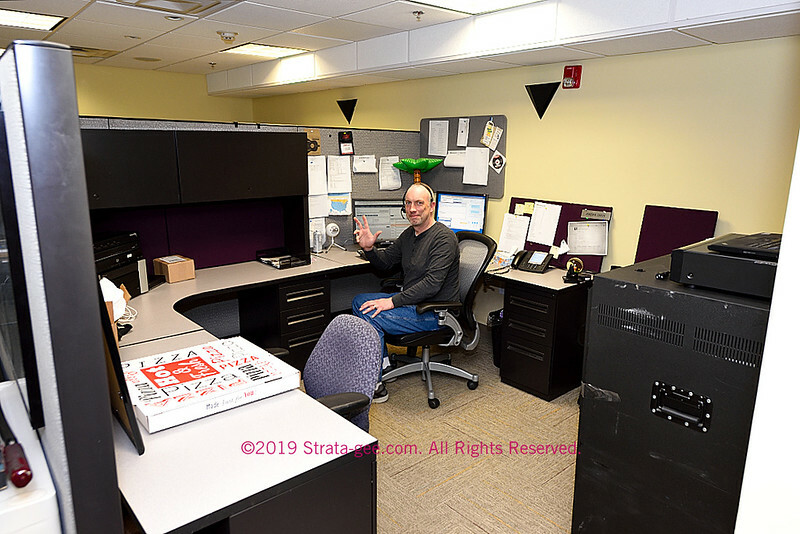 Perhaps because the company has been around so long, and many of the employees have been with them for years – I ran into some eclectic offices! Be sure to check out my slide show, which has many, many more photos than are shown in this post. 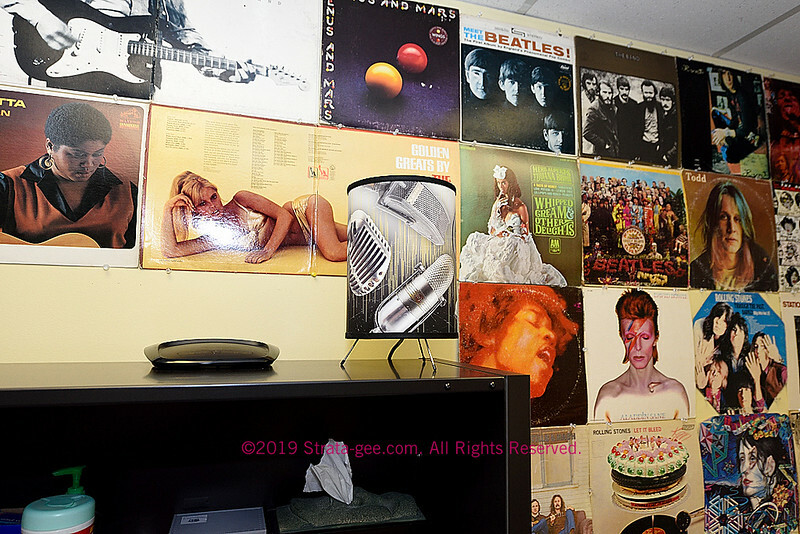 I know many of you youngsters will have no idea what these are, but one office at Russound was wall-papered with iconic vinyl record album covers. I loved it! See more photos of this office in my slide show. One of these offices had the walls lined with album covers – the large vinyl record album covers of a time gone by – almost all of them of iconic records from some of the most influential musical acts of our time. I felt compelled to take multiple photos (again, see my slide show) because it was such a cool look. By the way – If you love music, do yourself a favor and check out Page’s podcast called I’m In Love with THAT Song! available wherever you consume podcast content. I subscribe and it’s an excellent and fun listen! Russound has an in-house production studio, where the company creates product promotional videos, training videos, and a variety of webinars. You could outsource this production capability, but with a technical product line like Russound, it is better and easier to do it yourself. It is an investment, but this also helps maintain messaging consistency between your video and online content, with all of your other marketing initiatives. At this point, Porritt joined us and together we entered the support department with two techs hard at work, one researching on the computer and the other on the phone on a support call. 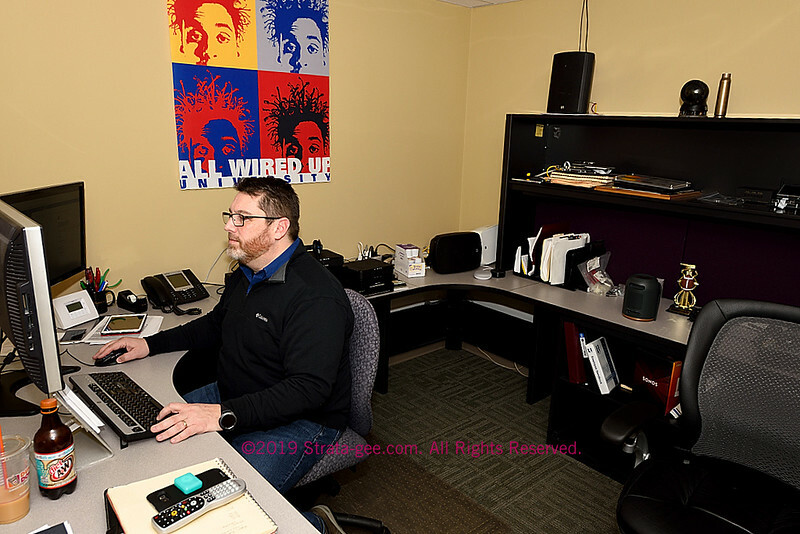 Again, like other tech support departments I visited, I saw products virtually everywhere, as support techs often need to put their hands on the item for which a caller has an issue. 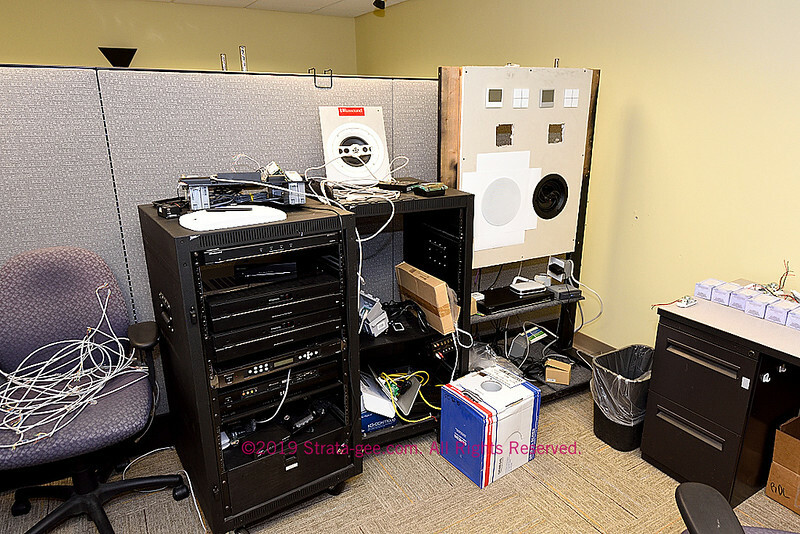 In the case of Russound, there were several racks which can be reconfigured with items to recreate whatever problem an integrator has identified, to help support come up with a solution. I saw the appropriate amount of product pandemonium in accordance with such a mission. And, I might add, the department was quiet, an unscientific sign that there were not a lot of vexing problems at hand. Should support techs come up against a really difficult issue, Porritt told me that they can and will get engineering involved. But this is not a common event, thanks to the fact that, the CEO tells me, their products are extremely reliable. Just one corner in Tech Support where items can be hooked up in an effort to recreate an issue an integrator may have called about. See the slide show to see a larger area where bigger racks give more space to create larger configurations. Where do you go after touring tech support? Well, the Service Department of course. We apparently caught them on a break, as there was no one in the department when I toured it, but here again it seemed quite in line with what I would expect. 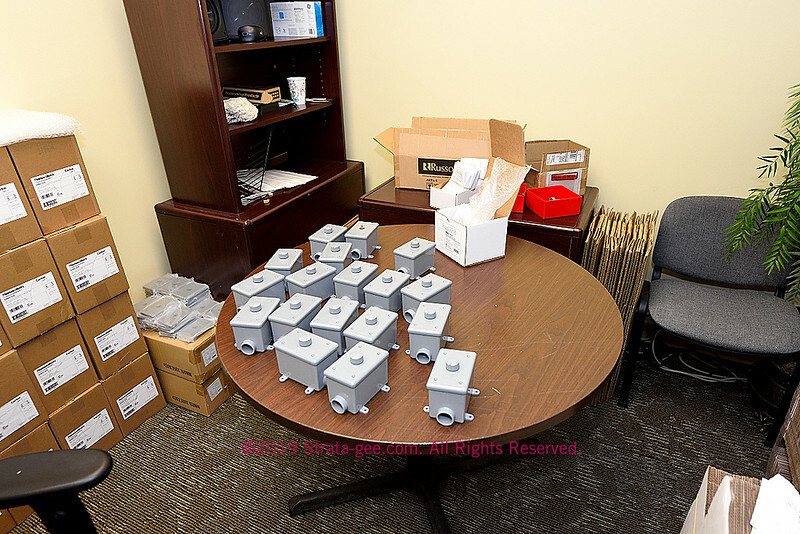 There was a small rack of items in for service, a few benches with testing jigs, test equipment, and all necessary supportive do-dahs – all as you would expect. Try as I might, I cannot break any stories of massive product failures, or units catching on fire, or any other salacious stories…just a solid, reasonably well-designed service department. From here we ascended a flight of stairs to move up to the company’s engineering department on the second floor. Near the top of the stairs you come to a wall with a series of photos of Russound products from over the years. All of these large photos have been signed by the requisite engineering team – a sign of pride for their contribution to model…and nice to see. 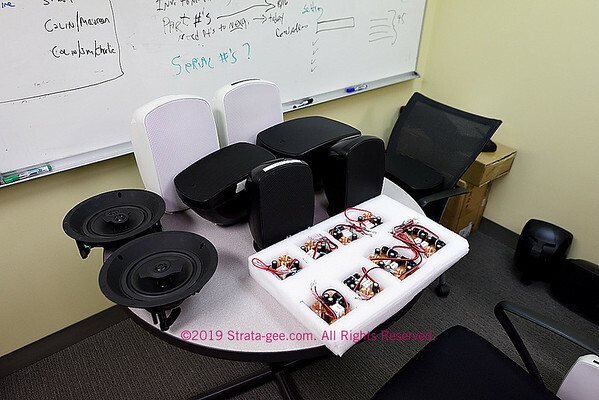 Russound’s Engineering Department – here Colin Clark and I observe samples of the company’s new MBX streaming products being exhaustively tested. A sign of a hardworking engineering team is that as a visitor wanders around this critical department – often considered the inner-sanctum of the company – the engineer stays focused on their high-powered computer monitors, nary a glance up at said visitor, or even the CEO for that matter. I saw stacks of circuit boards, assemblies, sample units, etc….common fare for such a department. No doubt, those exciting new developments that will allow humans to walk on water have been spirited away from the prying eyes of…well, me! Of course, it could also be that the silence I was met with was due to the fact that engineers are just not known as “people” persons. 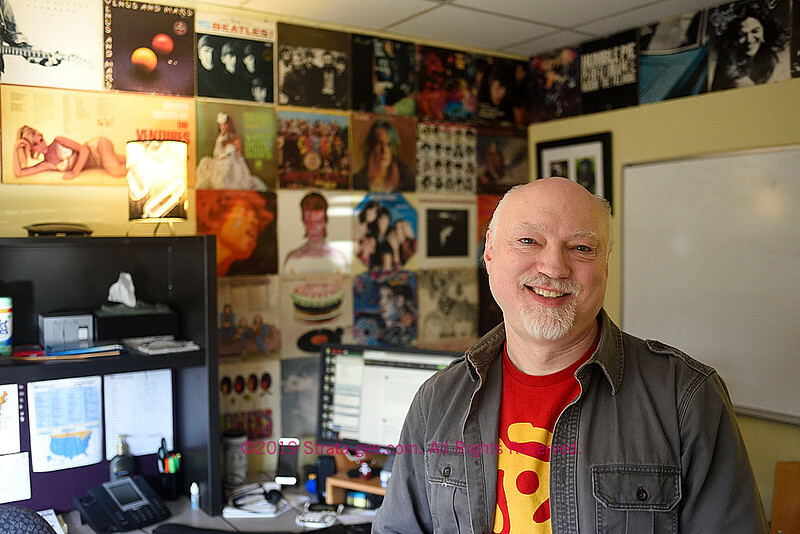 I always thought that until I met Bill Ramsdell, Russound’s VP of Engineering, who was warm and engaging. Ramsdell is one of those long term Russound employees – a 27-year veteran of the company – who helps ensure consistency in Russound’s commitment to build better products. 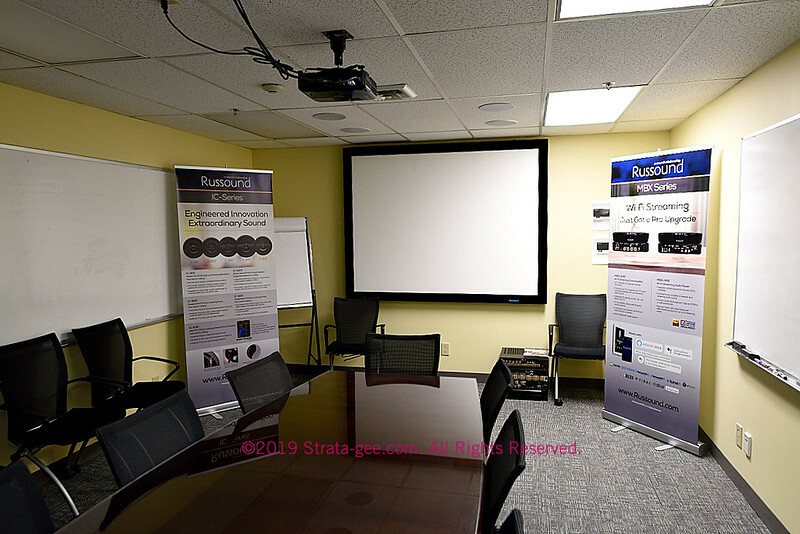 At the conclusion of our walk-thru of the Engineering Department, we returned to what would be my base of operations for the next two days, Russound’s main conference room. We would discuss much about Russound and its products, policies, and distribution. But also, to my delight, we would demo some of their new products. Demos are definitely one of my favorite things! Baldwin recounts how she came to work at the company in 1973, a “flower child” who “loved manufacturing.” She would ultimately go on to buy the company fueling a period of growth the original founder, Gaylord Russell*, likely never would have believed possible. “We had this great reputation for volume controls,” Baldwin recalls. And apparently for hard work – in those early days, her narration said, she often put in 70-hour work weeks. Later she mentions their move to Portsmouth, NH. Much of the roots of this company, and the philosophy of its current owner, guide the company’s outlook on business today: quality matters…reliability matters…being the best business partner to distributors and dealers – matters. Dealer Roundtables – The company is diligent in holding a series of organized dealer roundtables where they share often confidential information about products they are considering to make. Participants in these meetings fill out written responses on a “Product Concept Survey” form to questions posed by the company’s top executives. Questions are open-ended and participant participation (and individual responses) are kept confidential. These meetings are held regularly when a major product changes is being considered. RCI – The company’s Russound Certified Installer program is a serious effort to thwart unauthorized sales and installation of Russound products. In a nutshell, Russound products require a code to be activated upon installation. Installers – individual installers, not full integration companies – must register with the company to get proper credentials to do an installation. This pretty much kills gray market or eBay sales – and if a consumer gets a Russound product through some inappropriate means, Russound will direct him/her to a certified installer to complete the installation…for a fee of course. Training – The company is strongly committed to providing a high quantity of high quality product and installation training content. This includes both in-field and online training. 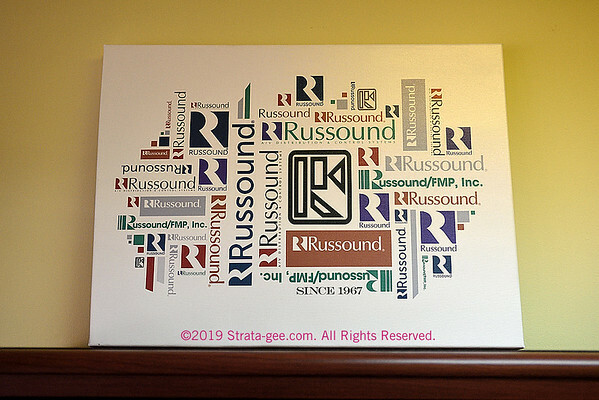 As I mentioned above, Russound maintains their own in-house studio that cranks out a lot of product and technology content to make installing Russound products easier than ever. There was, of course, much more information about the company’s initiatives presented here – but these specific highlights I found particularly noteworthy. 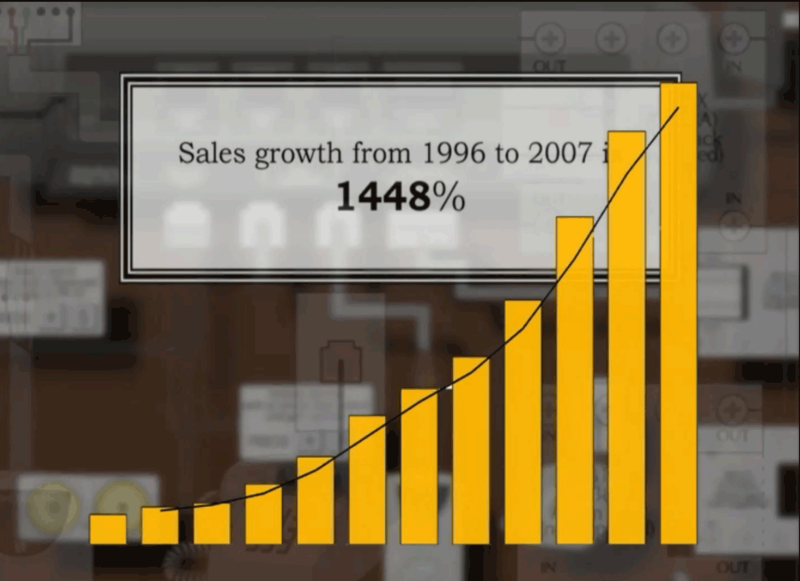 At this point, we moved on to my favorite thing – product demos…play time!! 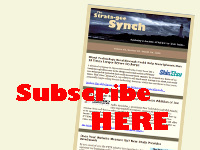 See my separate post about the new models the company is launching – and my impressive demo experience. 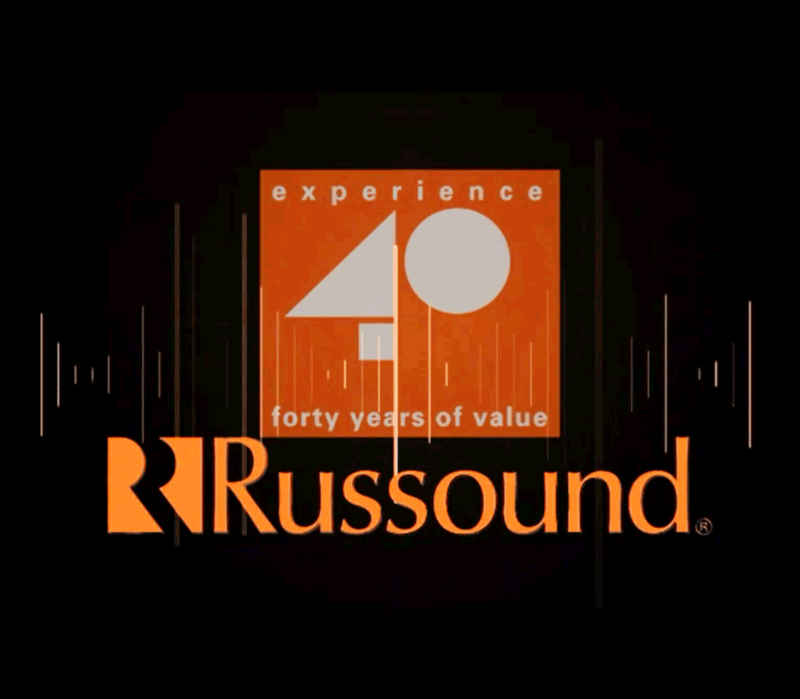 To learn more about Russound and its extensive line of products, visit: www.russound.com.